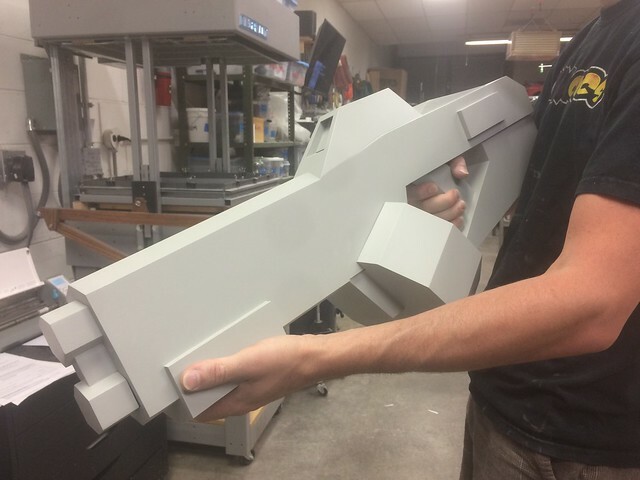 As part of a Kickstarter reward, the guys at Pixel Titans asked me to re-create one of the weapons from their throwback shooter STRAFE®. 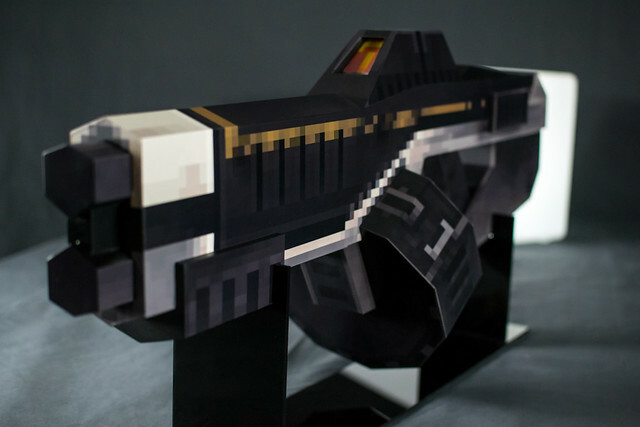 The community would vote on one of three guns to be built and I’d craft winning piece! Also, one lucky backer would get the finished product as part of a fund raising give-away. 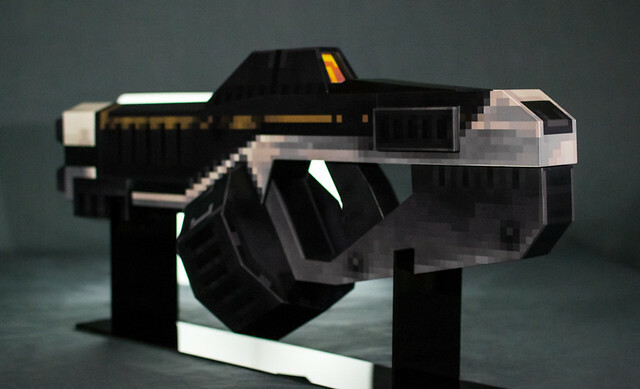 I started playing games in the 80’s, and Wolfenstein 3D/DOOM both had huge parts in my early gaming days. The retro aesthetic of STRAFE® is fantastic, and I was really eager to try my hand at making one of these things look simultaneously real and fake. 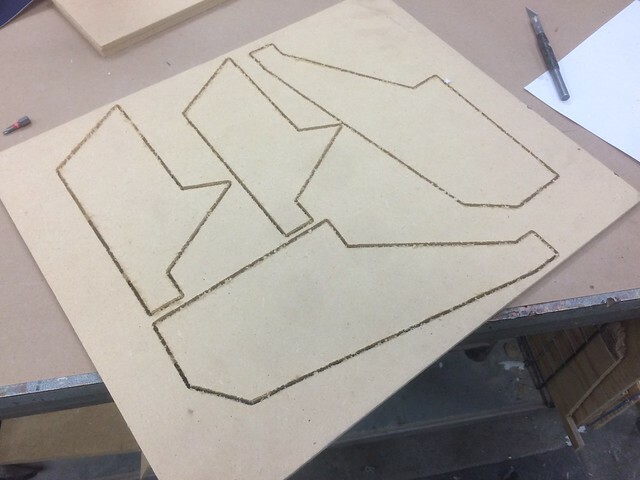 Absurd as the application may be, I put my Inventables X-Carve to the task of trimming flat panels for the gun parts out of 1/4″ MDF. Maybe overkill for this machine to cut straight lines, but this way I could be assured they’d be identical. 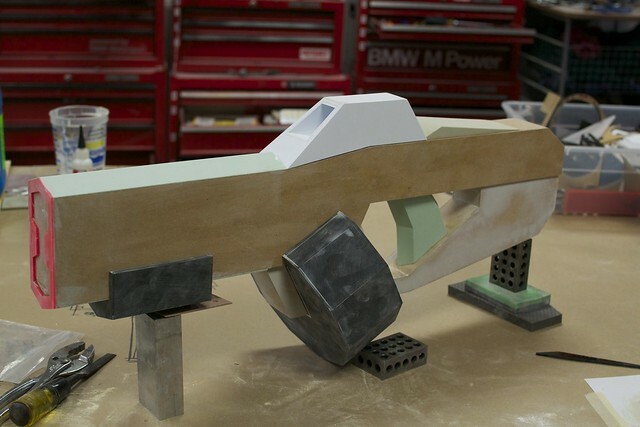 These pieces were glued and clamped over 3/8″ MDF blocks which made up all of the horizontal panels on the gun parts. 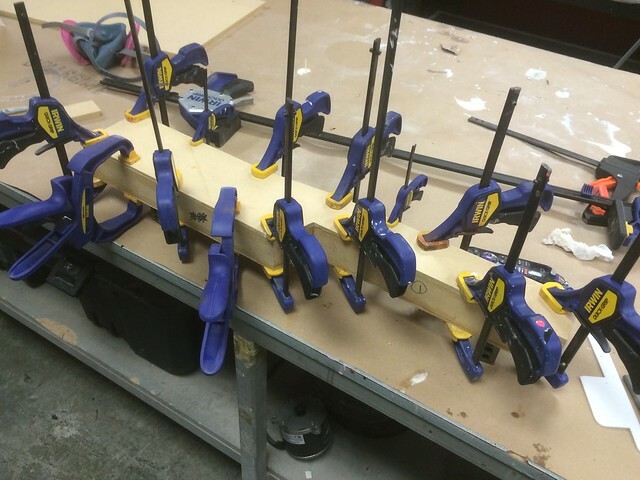 This required a lot of clamps. The lower grip/receiver was created in a similar fashion. 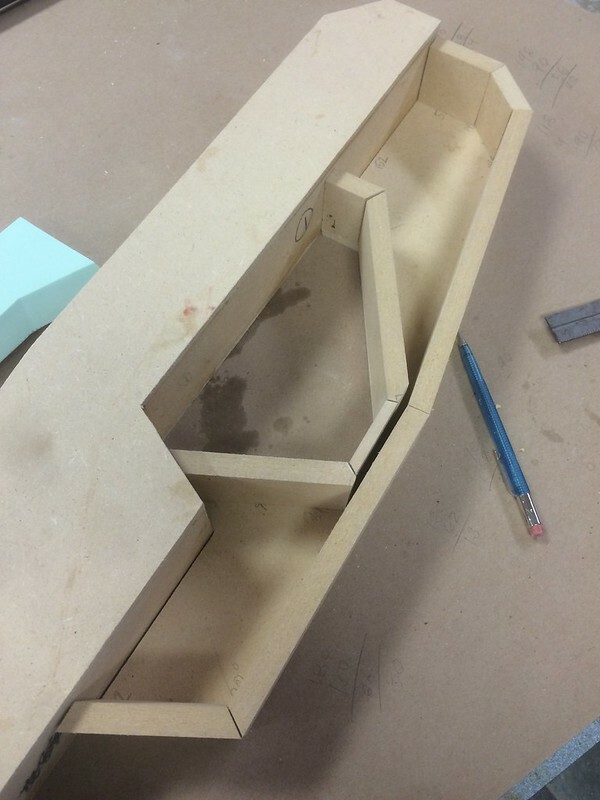 I made the side panels just slightly too thick, and this required me to plane the MDF down to a thinner profile. 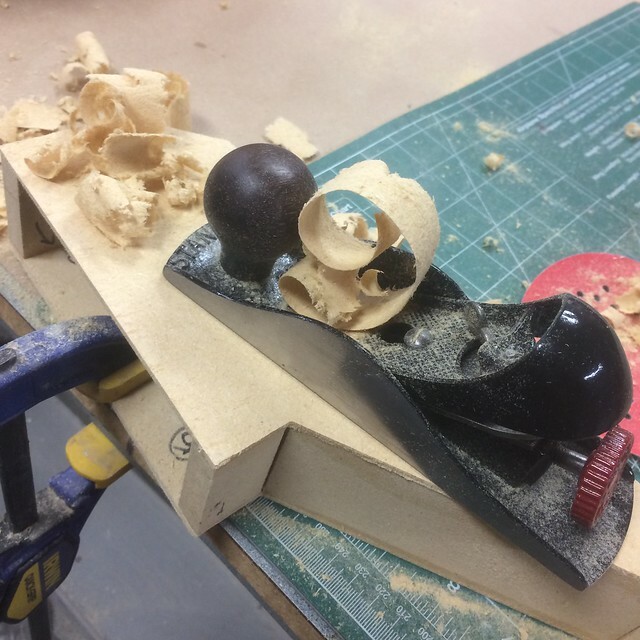 Real woodworkers, feel free to cringe at this. 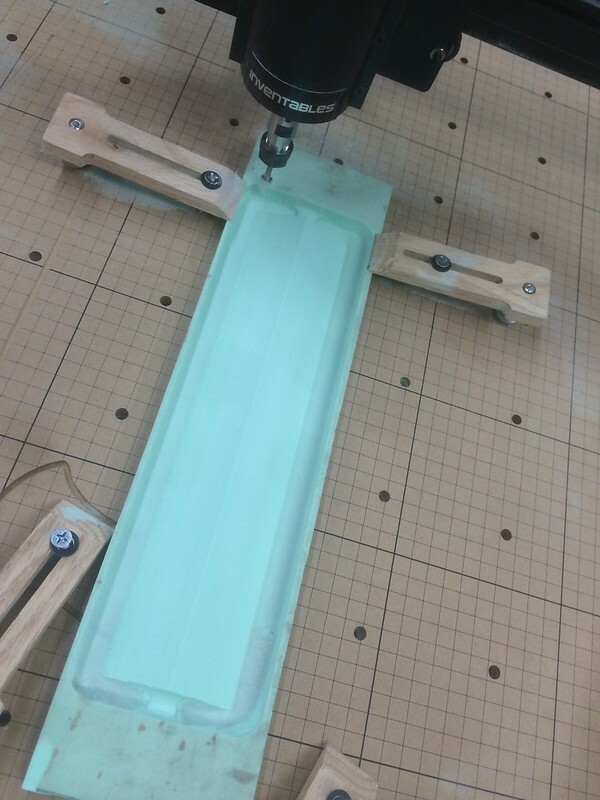 Urethane tooling board went onto the X-Carve to create the grip and raised triangular section on the upper barrel. This is 18# board purchased at The Engineer Guy. 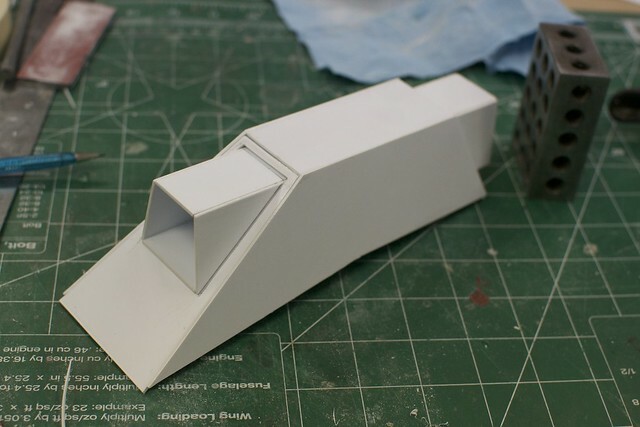 I used some thicker scrap board to make the forward barrels. No actual holes are present in the geometry, so flat facing barrels it is! MDF worked well for the larger sections, but for the magazine and pump I switched to acrylic. 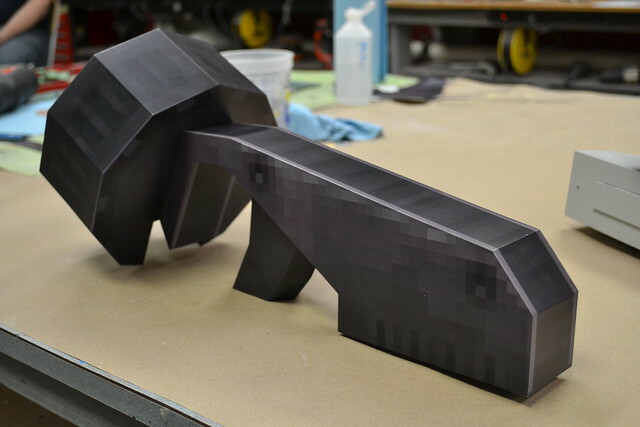 This was cut on my laser cutter, then the seams blended together with superglue and a lot of sanding. There’s a bunch of funky interior geometry that allows the magazine to slip over the lower grip and upper receiver sections while adding some structure and strength to the assembly. These shapes were extrapolated from the 3D file the guys at Pixel Titans sent me. Also extrapolated was the scope section. 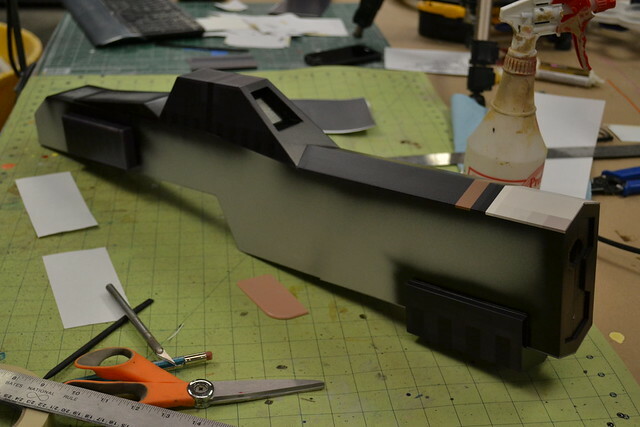 This part was a bit convoluted, but I was able to use 2D flat views of the gun from the profile and top to come up with a set of patterns, which were cut out on my laser cutter. 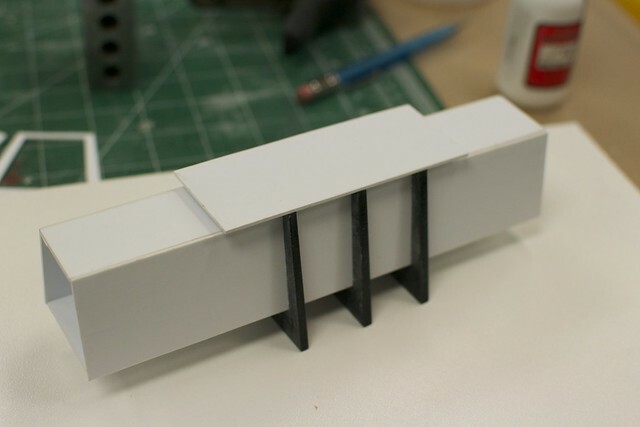 Acrylic “ribs” form the interior and exterior shape, and a styrene “skin” makes up the part itself. 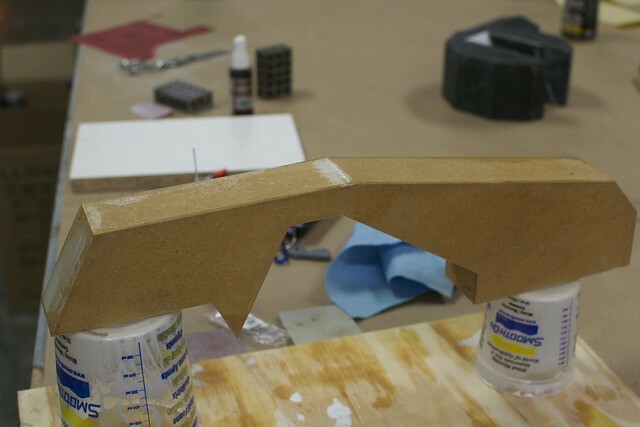 The middle cavity of the scope was made as a trapezoidal tube, then the edges were sanded flush after being glued in place. 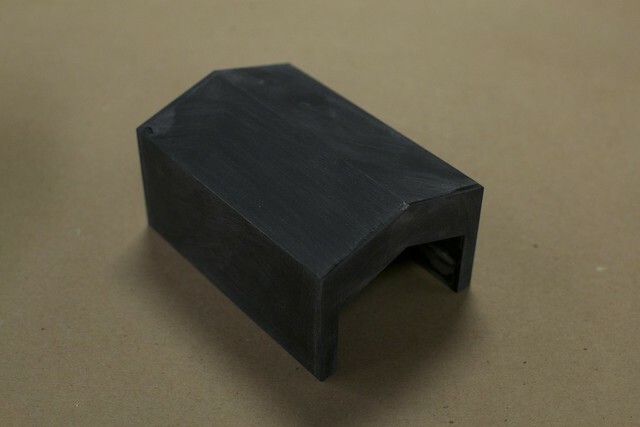 MDF is easy to build with, but its not the sturdiest material in the world. I used shellac to harden and seal the wood before moving on to primer. 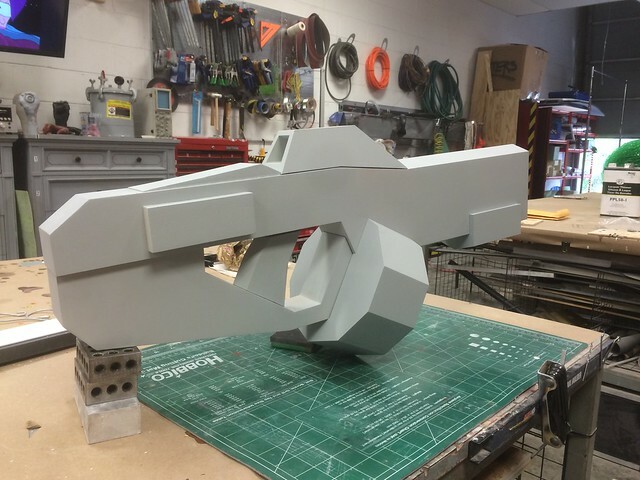 A last test assembly before paint. Looks…kind of comical. 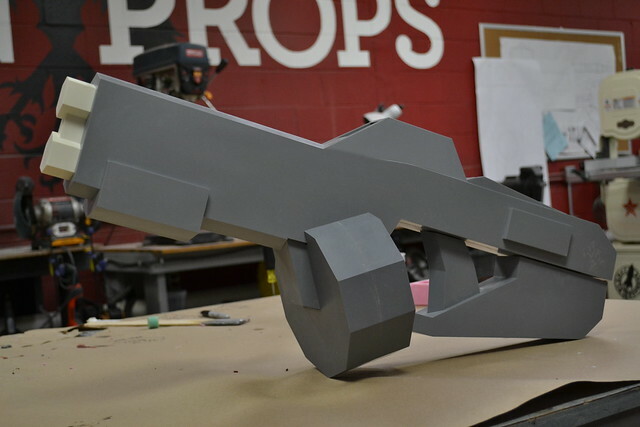 Several passes of 2K urethane primer were used to smooth out the MDF. 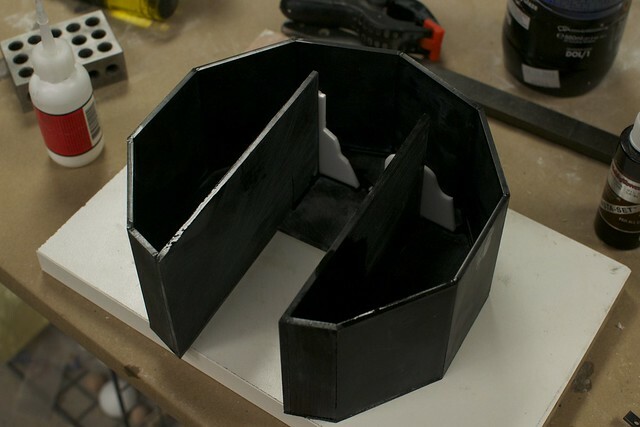 There was a bit of bondo needed here and there, but overall not a lot of cleanup needed. The finished parts all looked very neat (kind of like the game texture hadn’t loaded just yet) but they’re fragile acrylic, MDF and urethane foam. 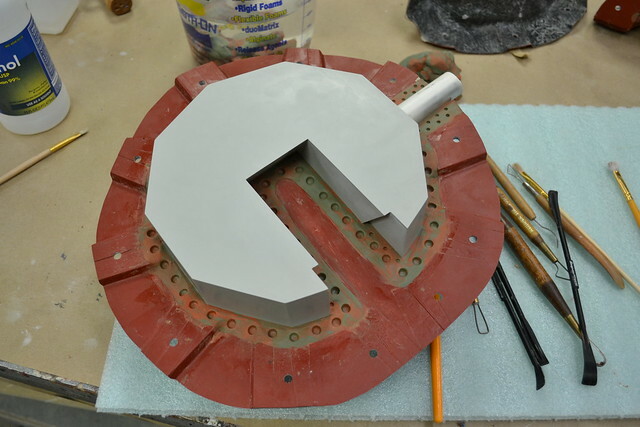 Everything needed to be molded and cast before the prop would be finished. 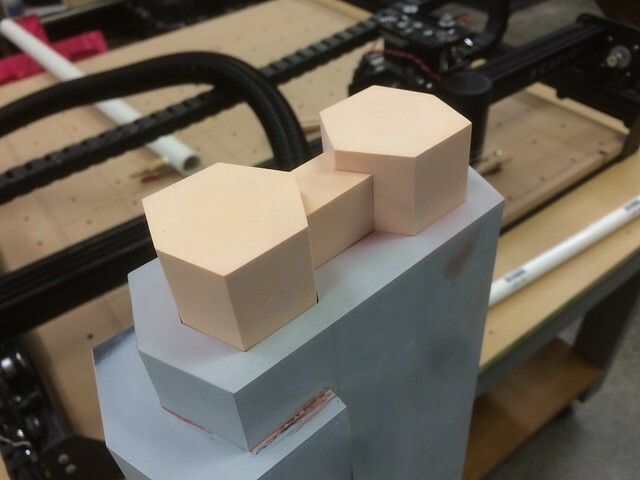 After being wrapped in plastic, the master sculpt part is covered in clay which acts as a stand-in for the eventual silicone mold material. Registration keys are added (the series of raised lines across the surface of the clay) and a parting seam is created out of aluminum flashing. Also necessary are the silicone and resin pour spouts. 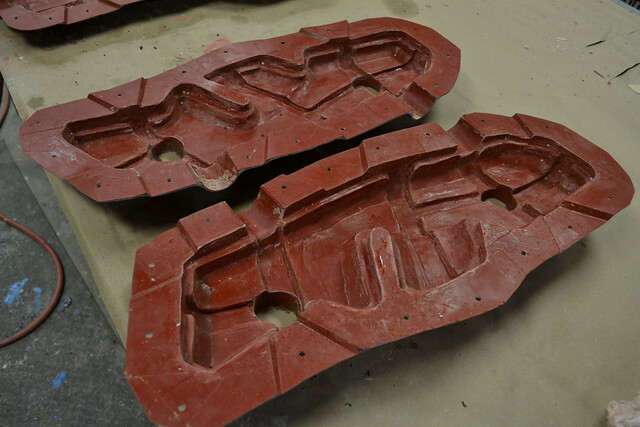 One set will be used for adding rubber to the mold, while the second set is used for pouring urethane into the mold once it’s finished. 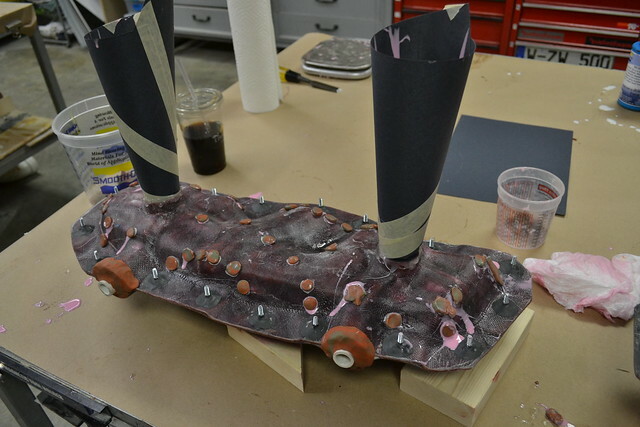 Epoxy and fiberglass are added over the surface of the clay, creating a rigid shell. This is called the mold jacket, or mother mold. 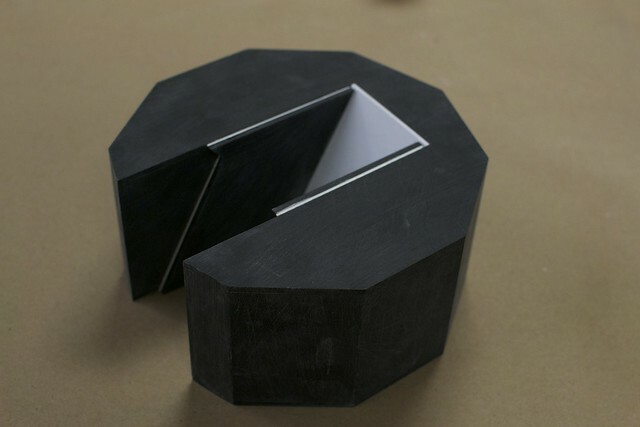 After one half is cured, the mold is flipped over and the process gets repeated to the opposite side. 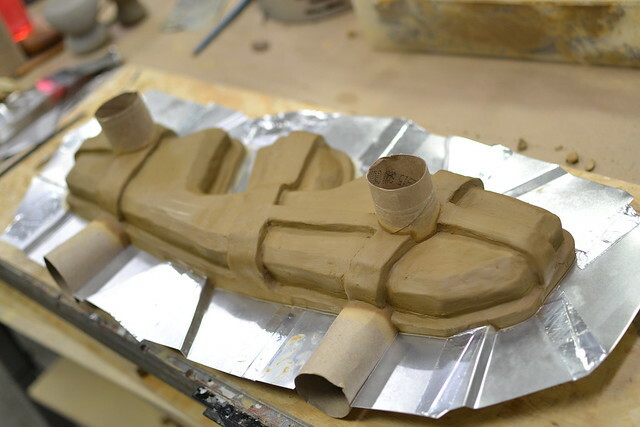 Once both halves are cured, the jacket parts are separated and the clay is cleaned out of their interior. Silicone is then poured into the cavity between the jacket and the master sculpt and allowed to cure. This gets repeated for the opposite side after removing the clay parting seam. 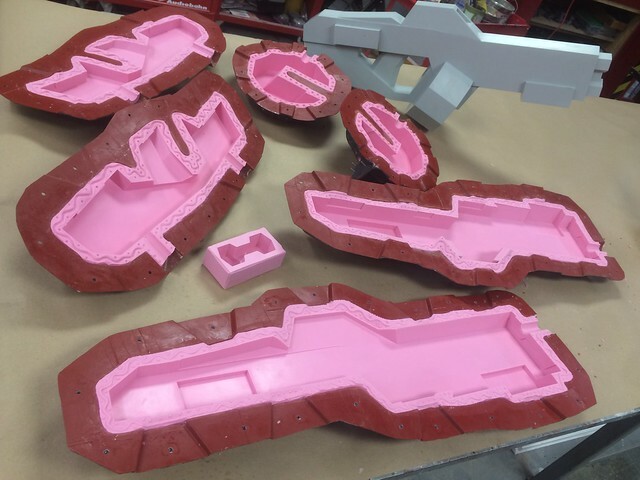 Here’s all of the molds for the gun. 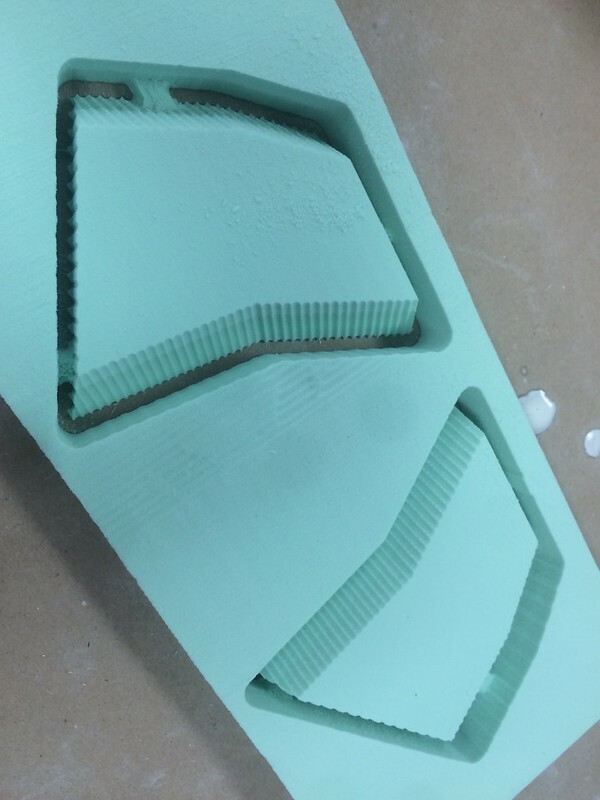 The silicone used here is Smooth-On Mold Max 30. 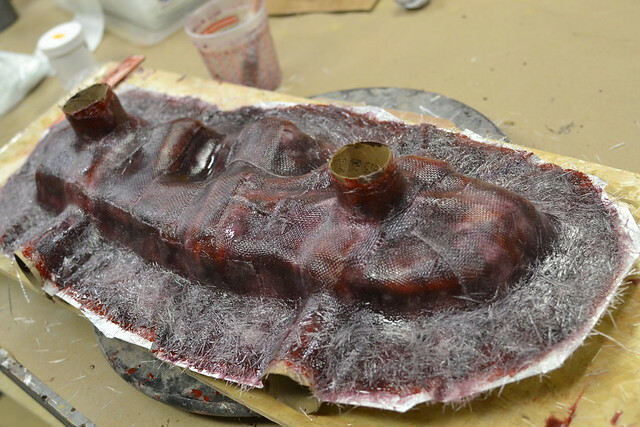 Mold jackets were created using Smooth-On EpoxAcoat Red, EpoxAmite 102 and Free Form Air. 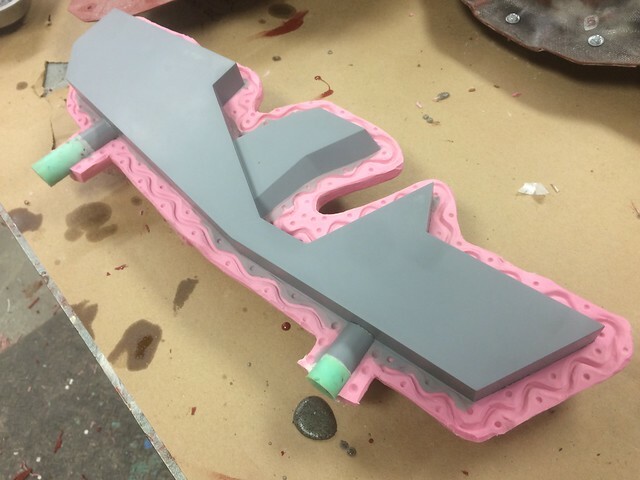 Castings were made on my rotocasting machine using SmoothCast 320 urethane resin. 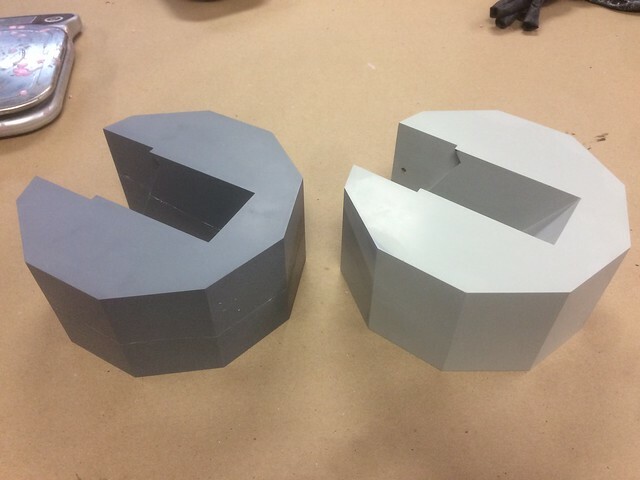 Rotocasting makes the parts hollow and quite lightweight. I had a copy of the gun very quickly! 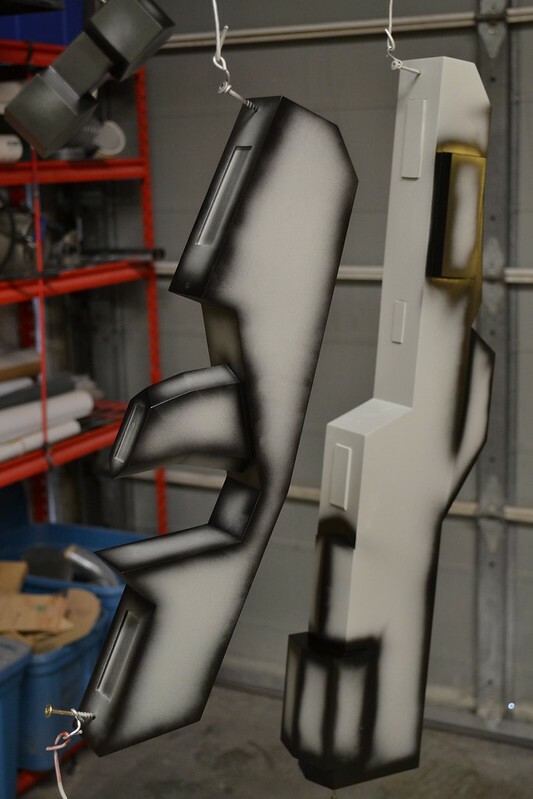 It was time for paint. Well, not paint per se. 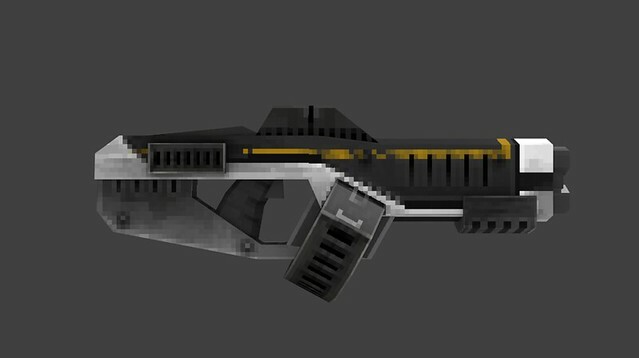 The project had changed slightly since the first artwork had been sent through, and the texture maps for the weapons had doubled in pixel count. Initially I had planned on painting the pixelated look by hand, but the new design meant I needed to come up with a different plan. Vinyl wrap! I scaled up the in-game artwork using photoshop, and wonderfully pixelation wasn’t an issue! 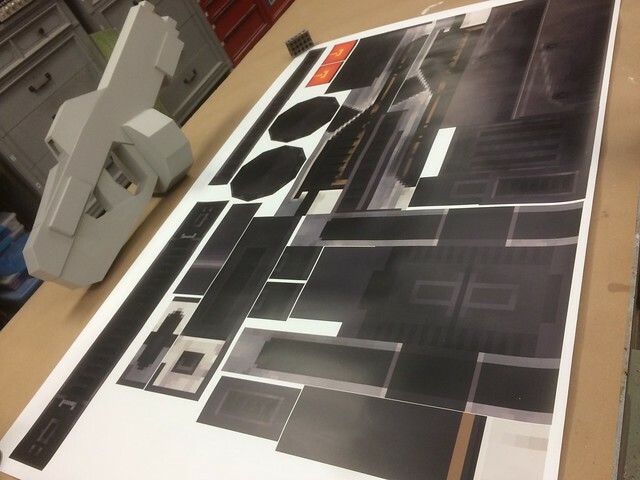 This was printed to matte adhesive-backed vinyl for application to the gun parts. 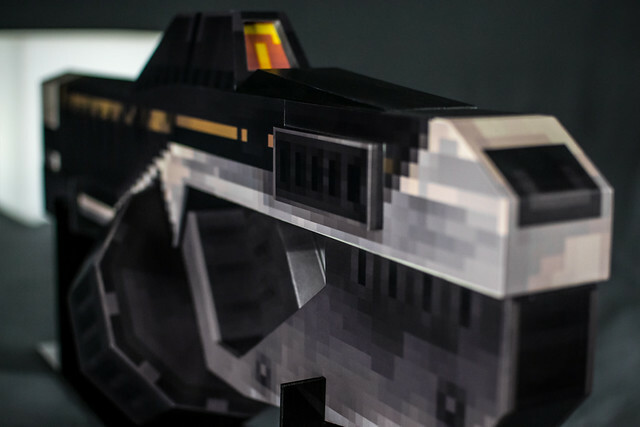 The gun was painted black along the edges to hide any gaps in the seams on the vinyl wrap. Since all of the shapes are flat faces, the wrap went fairly quickly. 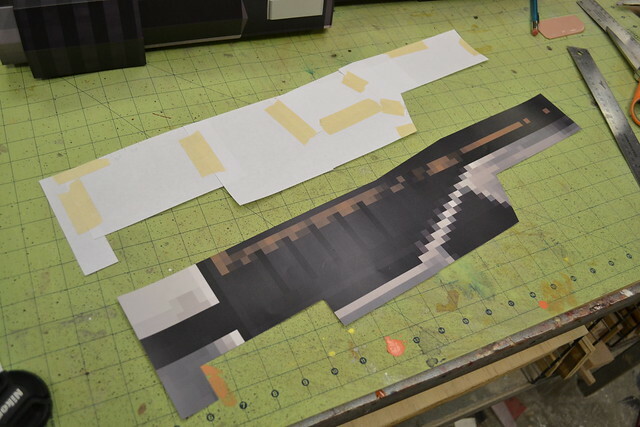 Larger parts needed paper templates crafted first before trimming the vinyl to shape. The more this thing went together, the weirder it looked. The effect really sells the flat look though! 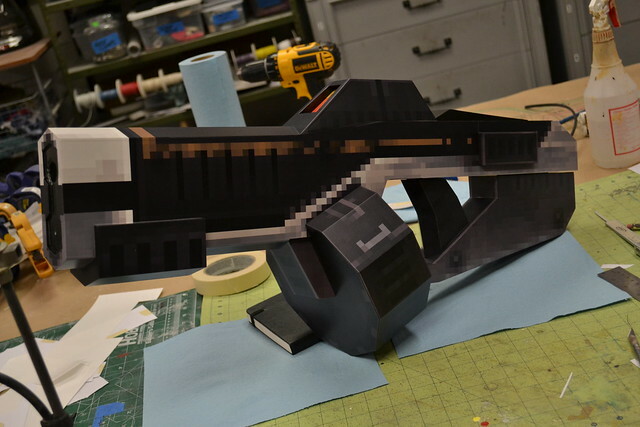 Once everything was wrapped up (har har) the gun was epoxied together and painted with flat urethane clearcoat to cut down on any reflective properties of the vinyl. 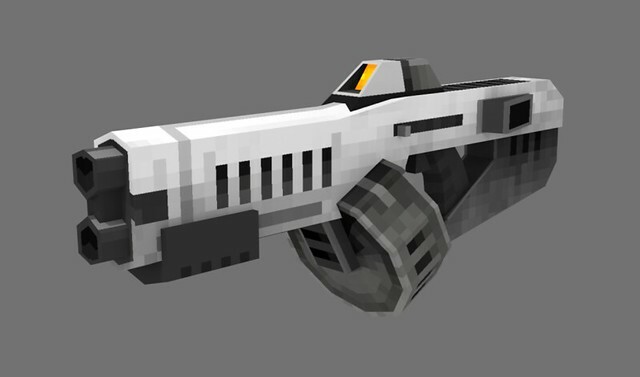 Here’s a few finished shots of the gun, which you can check out in higher resolution over in my portfolio section. 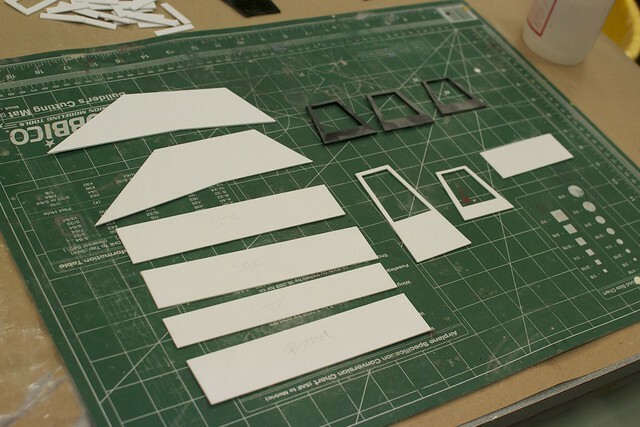 Also, there’s a bunch more photos (especially of the moldmaking process) on my Flickr page.